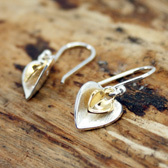 A stunning pair of heart shaped earrings from RP Designs. These well made earrings feature a sterling silver heart behind a gold plated heart suspended on solid sterling silver hooks. The sterling silver heart has matt finish on the front with a highly polished back. 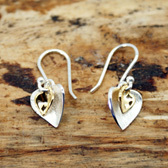 The gold plated heart is highly polished on both sides. 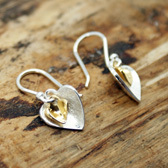 A truly special pair of earrings not to be missed.